Posted on March 11, 2014 by Kath Kenyon Tagged dollar storeis the dollar store a bargainstockpile at dollar storewhat should I buy at the dollar store	CommentsNo Comments on Stockpiling at the Dollar Store? Is the Dollar Store a worthwhile place to stock your pantry? Over the past few weeks I’ve started working on my stockpile with more organized intent. Sure, I’ve always bought extra cereal when it was on sale, but now I’m looking at foods and goods that are helpful in an emergency situation. I’ve read several articles lately on stocking your pantry or go-bag at the Dollar Store, so yesterday, I checked it out. The Dollar Store in our area is not a true dollar store. Items are around a dollar… many are more $1.29, $1.47, $2.99, and up. That’s understandable, this is the Bay Area of California, and everything here seems to be more expensive than it is in other places. My next out-of-state road trip should give me a better perspective on prices. So, is the Dollar Store worth your time? Well, yes and no…. I will start with the canned goods, since most everyone seems to want loads of them. The cans all started at $1.00, and went up from there. Now, a can of beans can be bought at Target for 84 cents, and if I have a coupon, or bump into a sale at my local grocery store, I can get them as low as 50 cents. The same is true for canned spaghetti /beefaroni or stew. To me, the DS isn’t a bargain for those items. My DS was stocked with LOADS of ethnic foods. Thai, Indian, Mexican and Chinese sauces and spices loaded the shelves. Because I like to cook a wide variety of foods, I checked the prices. They are lower in the DS than at the grocery store (in the specialty aisle), but the price isn’t much better than going to a local ethnic store. In fact, I shop for most of my spices at a local Indian store in bulk. Then I re-bag at home. There are a number of items that are a worthwhile purchase. 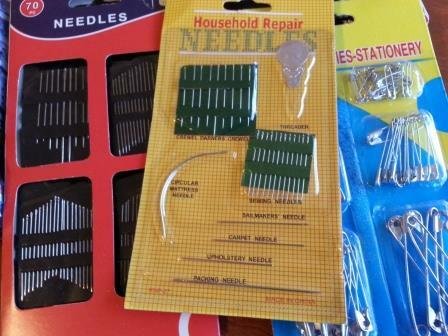 Sewing Needles and Upholstery needles are a bargain at $1.00 for a packet of 30. Safety pins are also a must get. The craft store sells them for much more. You can get clothesline at a reasonable price. I bought one, and put it in the back of the car straight away. There were loads of storage containers, and the prices seemed alright. 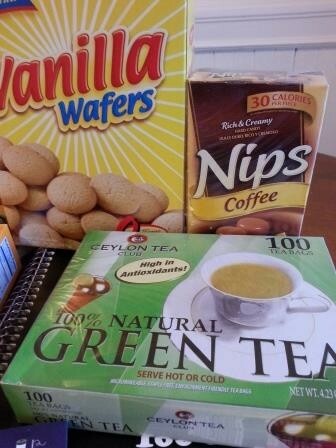 My other purchases were tea (I’m a tea drinker) at $1.00 a box (great price), tropical dried fruits and some Vanilla Wafers (I use them for pie crust). 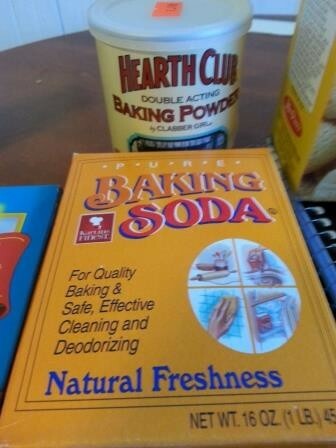 Since I’m a baker, I grabbed up baking soda and baking powder. Because I want to check on the quality of these products, I only bought one of each. School supplies like pens, spiral notebooks, paper and crayons seemed reasonable… but Target, Walmart and most office stores have incredible discounts in August, and I stock up then. Finally, I bought hard candy. I love having hard candy in my bag or car to quell the hungries when I need something sweet. Having candy or gum in an emergency situation can be a calming thing. They had loads of different kinds. I am a bit skeptical about some of the no-name brands, but I’d give them a try. Now, I looked at the tools and kitchen supplies. The cleaning products looked like they were reasonably priced, and I just purchased a load with coupons last week, so the prices were still familiar. Vinegar, ammonia, and bleach were more than a dollar, but still reasonable. The tools made me feel uncomfortable. Maybe it’s an old bias, but my daddy taught me to buy GOOD tools so they don’t fall apart on you when you need them. Of course, in a pinch I’d take a second rate hammer over nothing at all. The same holds true for the kitchen gear. Some looked shoddy. Other things looked fine. My analysis, for what it’s worth, the Dollar Store can be a good place to buy certain things, but not everything. Go in knowing what you want/need… and go in knowing what the appropriate price should be. Don’t go in like a kid in a candy store thinking “oh, it’s only a dollar”… those dollars do add up. Check expiration dates, look for dings in the cans, feel the materials. Remember, you are shopping for items that you may need to count on; cutting corners on important things is a bad idea. This entry was posted in preparing for survival, Uncategorized and tagged dollar store, is the dollar store a bargain, stockpile at dollar store, what should I buy at the dollar store. Bookmark the permalink. ← Prepper Mom/ Sports Mom…. Same Skill Set?